Just because the weather gets colder, that doesn’t mean you have to go without fresh vegetables. With the help of hydroponic gardening, you can enjoy salads, cucumbers and tomatoes even though winter might traditionally dictate those crops are out of season. Many growers prefer to turn to hydroponic gardening in the cooler months, with sales starting to climb in August and extending through April as they help fill the void of what’s usually available. Generally, this method of gardening is regarded for its environmental friendliness—it uses less water and doesn’t erode topsoil. The growth rate is faster, so the yield is higher. Plants absorb more oxygen, which helps stimulate root growth and take in more nutrients. Some even say hydroponically-grown produce is packed with more nutrition and it tastes better. But why winter hydroponic gardening? Of course, it helps provide fresh vegetables year-round, so you can enjoy the straight-from-the-vine taste of cucumbers, tomatoes, lettuce and other greens—all ideal for throwing together a salad that takes you right back to the fondness for summer. To get to that point, you have to actually do some work in your garden, and that can be helpful in fighting the seasonal blahs. In other words, you don’t have to wait for spring, and you don’t have to wait a while for crops to grow since everything grows faster using the hydroponic method. Additional options for winter growing in your hydroponic garden are carrots, broccoli, spinach and herbs, such as oregano, parsley, rosemary, cilantro, thyme and chives, to add even more flavor to your foods. To successfully pull off hydroponic gardening in the winter months, you will have to take into account several things. You may need to supplement less natural light during the shorter days with artificial options, and that means higher energy costs. Drier air in cooler weather means having to add humidity with a humidifier or even misting the plants. Along with managing light and humidity, it’s important to keep the temperature in check. Swings in temperature can send plants into shock. It’s recommended to maintain a 60 degrees Fahrenheit environment. How can you get started on your hydroponic garden this winter? 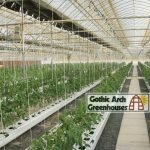 Call one of our friendly representatives at 800-531-4769 or visit us at www.GothicArchGreenhouses.com, so we can help you get growing! 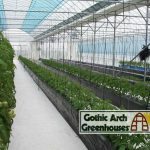 This entry was posted in Hydroponic Systems and tagged advantages of winter hydroponic gardening, hydroponic gardening, winter hydroponic gardening on November 15, 2017 by admin.